Scroll through for a general description, our local bylaws, Game rules and a completed score sheet or choose one of the topic here for the pdf versions. · There will be no skill level limit. · A maximum of four players will be permitted on a roster; three of the four team members will participate in each team match. · Masters 9-Ball – The player has won the game when he has legally pocketed the 9-Ball without scratching. · Jump Cues – The use of jump cues is allowed in Masters Division play. Be aware that even though Masters’ rules allow for the use of jump cues, Local League Bylaws or Host Location “house rules” may choose to limit or strictly prohibit their use. · Forfeits – An individual player match is worth five points. · Playoff Matches are scored the same as in weekly play except a forfeited individual player match is worth seven points. In the case of a tie at the end of a team match, the tie would be broken by the number of individual matches won. We welcome your team to the American Poolplayers Association. In order for us to enhance your enjoyment and the service of the league, we must enforce local bylaws, which are designed to allow smooth operation of the league. These bylaws have been read and approved by the American Poolplayers Association, Inc. The local bylaws are a secondary source of information created in accordance with and in addition to the Official Team Manual. Office Hours: Monday through Friday 10am to 6:00pm. If not available, leave your name, phone number and the reason for your call and your call will be returned as soon as possible. If you need immediate assistance please contact your Division Representative whose number is located on the top of your score sheets. · $30 per team for all scheduled matches regardless of number of games played or forfeits. Team books are due after Play is complete that day. The APA is not responsible for cash; we recommend that all dues be paid by check. There will be a $15 charge for any returned checks regardless of the reason. · The APA player membership dues are due the “FIRST TIME” a player plays or by the 4th team match/2nd month, whichever occurs FIRST. · Once a match is played the fee is owed, even if you decide to discontinue playing. The fee will become the teams’ responsibility if not paid. Any team playing an “unpaid” player or not providing full information on added players runs the risk of receiving ZERO points for that player’s matches. By the 4th team match/2nd month, each team must inform the Local Office in writing of any name omissions, spelling errors, etc of their roster. Captains, this is your responsibility; rosters published on the 4th team match/2nd month that have no comment from you will be considered correct and official. · No team will be permitted to play in the Play Offs/Vegas Cup if there is an outstanding balance due. If a team is behind in dues, they will receive no points after the second week of non-payment, and will be dropped after the third. If a team drops out by the 4th team Match, all points will be adjusted to 15 points for the team(s) that played against them. If a team drops out mid-season (5th week and beyond), all points will remain as stands for all matches played. An individual player from a dropped team or a team with a past due balance will be required to pay his portion of the team fees owed before he or she may rejoin a different team. · In the last 3 matches of the session, if a team forfeits 15 points or more, they will not be eligible for the wild card draw. If there are a total of 6 or more forfeits for the session, the team will not be eligible for the wild card. · Any team or player dropping out or suspended from the league forfeits all benefits, trophies or other awards from the league. · Get into the habit of reviewing the team standings each week. 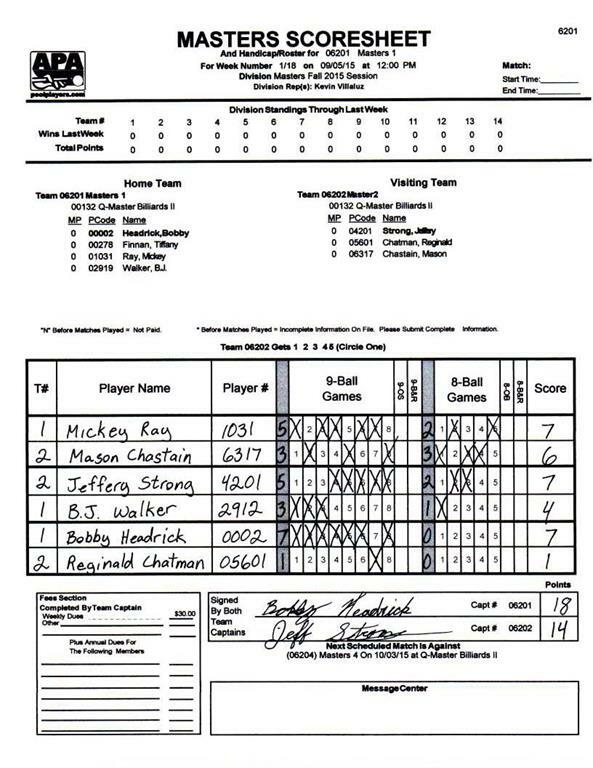 Sometimes the scorekeeping is such that we cannot tell who won a particular point, especially if we receive only one of the score sheets by the deadline. If you did not get credit for the correct number of wins, let us know right away. Do not wait until week 10 to tell us about a scorekeeping error in week 3. Slow Play: Be familiar with the POOL ETIQUETTE. If your opponent goes a few seconds over the 1-minute guideline, do not jump up and start complaining. Regular, makeable shots should be executed in 20 – 30 seconds, on average, with 1 minute being the reasonable for difficult and/or potential game ending situations. Players that consistently exceed these guidelines should be reminded of the time limits and a notation made on your score sheet. If you, or your team, are the subject of several such “slow play” complaints, expect a warning and then points may be deducted for further violations at LO discretion. Start time: Play will begin by 15 minutes after official start time even if only one player from the team is present. Play must be continuous; otherwise forfeits will be awarded to the team, which is present. Remember, you joined a team to play – not receive forfeits. Closing Team Rosters: No player may join a team after the 4th team match/2nd month. Exception: For the survival of a team, players may be added to a team after the 4th team match/2nd month, but only with approval from the League Office. Survival is defined as having no more than 2 active (still available) players on the roster. Those players who are unavailable but still listed on the roster will have to be dropped from the roster. Survival additions must be approved by the league office prior to play and the opposing team Captain must be notified prior to the start of play. If this exception were not allowed, teams that lost players through circumstances beyond their control would be forced to quit, leaving byes in the schedule. Teams do not join the league to get forfeits; they join because they want to play. The APA appreciates your understanding of this exception. This exception does not grant relief to teams that have a couple of players out of town or on vacation and another player that has the flu. These are temporary situations and result in the forfeiting of points that week. This rule pertains to teams that have players that have become permanently (for the balance of the session) unavailable to the team. Player ID Players must be able to show a valid PHOTO ID to the League Operator or any team member at any time. Teams that play a player under a false name will receive 0 points for the night and will be at risk of suspension from the league. Their opponents will receive 7 points for any match involving an illegal player. Ask for ID’s prior to play! Bonus Points 4 bonus points (2 for your completed scoresheet and 2 for payment) will be awarded each week for teams that have their books ready for pickup, have the correct amount of money as well as a completed, legible score sheet in it. There will be no exceptions. Be careful that you do not lose your bonus points! Forfeits: If a team fails to show for a match, the opposing team (providing 3 players are present) will receive 15 points plus 4 bonus points if all paperwork is completed and dues are paid. Byes are worth 15 points plus bonus points. Rescheduled Matches: If a match needs to be rescheduled, the Team Captain should call the opposing Team Captain at least 24 hours in advance of the scheduled match. Both team captains must agree about when to reschedule otherwise, Make up guidelines will be followed. All rescheduled matches must be made up within Three (3) weeks of the original match, unless pre-approved by the league office. No matches will be made up the last 2 matches/last month of the session. The league office must be informed of any rescheduled matches. No exception. If you know you will not be able to play, you can always play the match early. Do not wait until the last minute. Makes Ups: There will be NO SINGLE MATCH MAKE-UPS. Single Matches not played will result in Zero Points. Team matches must be made up within THREE weeks of the missed match, unless approved by the LO. If the Match is not made up within that time frame, each team WILL receive 10 points, No bonus AND be responsible for the weekly fees of the missed match. NO make-up matches will be allowed for the last 2 matches/last month of the session. Protest All protests must be in writing and include a $25 protest fee. The League Operator will inform the team that wins the protest and return their $25. In tournament play the protest fee will be $50. Banned Players If a player has been banned from a location, then the team must play without him/her. The league has no right to insist a host location admit this player. Falsification of Score Sheet Any team caught sending in falsified score sheets will be subject to any penalties handed down by the League Operator. Double Play: To preclude as many legitimate default situations as possible some teams can play ONE of their players TWICE in the same match. To invoke this rule a team must have only 2 eligible players or less at the match site AND both of those players must have already played once. The team (with at least 3 players attending) will choose which player from the opposing team will play twice. Teams must allow double play. . This benefit is limited to 4 times per session. Post Season Play: Players are required to have 6 matches played per session with the team eligible for post season play (play-offs on) in order to participate with that team during the post-season. This benefit is limited to 4 times per session and not eligible to be used during the last 2 team Matches of play. If you think your team will have trouble fielding players, you can always pre-play your match. The OPPOSING team (with full roster attending) will choose which player will play twice. Payment: Payment for the member who plays twice is up to the team. The forfeit would have had to be paid for. Decide ahead of time whether it is the players’ responsibility or if the team will divide it equally. To help make your day of League play enjoyable, as well as enhance the enjoyment of those around you, please observe basic guidelines of etiquette. Treat your opponent as you would like to be treated. Pay attention to your match; be ready to shoot when it is your turn so you don’t slow down the match. If you are expected to play the next match, have your cue ready, and begin your match as soon as the previous match is over. Cheering for your teammate is part of the fun, but don’t cheer against your opponent. A fun and competitive day of League play is a goal that can be achieved by observing these guidelines and displaying good sportsmanship. Team Captains flip a coin to decide who must declare the first player. Winner of the toss has the choice of declaring first or having the opposing Team Captain choose first. Whoever chooses first for the first match chooses second for the second match, and first for the third match! Players lag, with the winner of the lag having choice of format (8-Ball or 9-Ball) or the break. Once the format has been chosen, the entire set of that format must be completed before moving to the next format. 8-Ball is played with a cue ball and a normal rack of fifteen (15) object balls. The primary purpose of this game is for one player to pocket the solid balls numbered from 1 to 7 or the striped balls numbered from 9 to 15, and then marking and pocketing the 8-ball before his opponent. Choice of balls to be pocketed is made by the player legally pocketing the first ball of the game. All balls should be frozen (touching) as tightly as possible. Balls are racked with the front ball on the foot spot and the 8-ball in the center of the triangle. The breaking player may request and receive a re-rack. To be a legal break, players must break from behind the head string. The head ball or the second row of balls must be struck first and at least four object balls must be driven to the rails or a ball must be pocketed. The cue ball may not be shot into a rail before the rack. If the rack is struck, but the break does not qualify as legal, the balls are re-racked and re-broken by the same player. If the rack is struck, but the break does not qualify as legal and results in a scratch, the balls are re-racked and broken by the opposite player. THE RACK MUST BE STRUCK BEFORE A FOUL CAN OCCUR. Breaking safe or soft is not allowed. The League Operator may make judgments and issue penalties to teams and players who are not breaking hard. Breaking just hard enough to comply with this rule is not a guarantee against penalties. Remember; break as hard as you can with control. 1. A foul on a legal break will result in ball-in-hand behind the head string and the incoming player has an open table as defined in "5". The incoming player may then shoot at any ball that is outside the head string. Outside the head string is determined by aligning the middle or base of the ball with the imaginary line (head string) between the centers of the two appropriate diamonds. a. If an object ball is dead center on the head string, or out, then it is playable. If it is in, the ball is not playable. If the two players cannot agree on an object ball being in or out, then a third party is consulted for an opinion. If a third party is consulted, his opinion is final. To shoot at a ball that is in could be considered a sportsmanship violation to be reported to the League Office. b. The cue ball must be in as described above before play can begin. It is up to the opponent to check to be sure the cue ball is in before it is shot. This is not a foul; no penalty may be assessed. If the cue ball is out, the shooter must place the cue ball behind the head string. To refuse and shoot anyway would be considered a sportsmanship violation to be reported to the League Office. 2. No balls are pocketed and it is the other player's turn. 3. 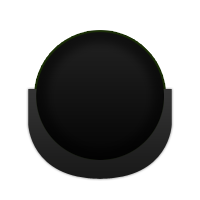 The 8-ball is pocketed. This is a win unless the player scratches, in which case he loses. 4. A ball is pocketed (example: the 3-ball); now it is still the breaker's turn and he is shooting low balls (solids). 5. A ball of each category is pocketed (example: the 6 ball and the 12-ball). Now the breaker has his choice. He may shoot at either category of balls. He may shoot any ball except the 8-ball (which would be a foul); if he does not foul, anything that goes in counts. If he were to make one of each on his second shot, he would still have an open table and the same choice as after the break. If he were to miss or foul on his second shot, his opponent would have an open table. If the opponent then shoots and makes a ball, but also fouls on the shot, it is still an open table. Open table means a player can shoot a combination involving a stripe and a solid and whichever he makes, without committing a foul, would be his category. 6. If two balls of one category and one ball of the other category are pocketed (example: 3, 6, and 10-ball) it is the shooter’s choice just as in “5” above. 7. Occasionally, a player mistakenly starts shooting the wrong category of balls. Although it is sportsmanlike for the sitting player to remind the shooting player that he is about to foul by shooting the wrong category of balls, it is not a requirement for him to do so. Once the shooter has hit the wrong category of balls, the foul has occurred whether the ball is pocketed or not. If the ball is pocketed, it is permissible, though not recommended, that the sitting player allow the shooting player to continue shooting his balls in until he feels inclined to call the foul. The shooting player can escape penalty by quietly realizing his error and returning to shoot the correct category of balls and legally contacting one of them before his opponent calls foul, or by finishing off the wrong category of balls and legally contacting the 8-ball prior to his opponent calling a foul. In other words, the sitting player must call the foul before the shooter returns to the correct category and legally contacts one, or before the shooter pockets the remaining balls of the wrong category and legally contacts the 8 ball. Once a player makes legal contact with the 8-ball, the player assumes control of that category of wrongly pocketed balls and can win the game by legally pocketing the 8-ball. In addition, if the sitting player does not call a foul before his opponent’s turn ends, and subsequently contacts the wrong category himself, both players will assume the new category of balls for the remainder of the game. Before any foul has occurred, the shooter also may avoid penalty by asking the sitting player which category of balls he has. The sitting player must tell him the truth. Combination shots are legal, but striking the correct ball first is required except in the open table situation. The 8-ball is not neutral. A player is credited with all balls he legally pockets. When a player does not pocket one of his balls, but pockets an opponent's ball, he loses his turn. The opponent gets credit for the pocketed ball. No pocketed ball is ever spotted. Knocking the cue ball off the playing surface is a foul. If the 8-ball is knocked on the floor, it is loss of game. Knocking any other object ball on the floor is not a foul. Object balls that get knocked off the playing surface will be spotted on the foot spot. If the foot spot is taken, the ball will be placed on a line directly behind the foot spot as close to the foot spot as possible. If two or more balls are knocked on the floor, they are placed in numerical order with the lowest numbered ball closest to the foot spot; the placed balls will be frozen to one another. It might occur that a player legally pockets a ball while simultaneously knocking some other ball(s) on the floor. In this situation, it is still his turn and the ball(s) is not spotted until he misses. If the ball on the floor is one of the shooter’s balls, then it is spotted when the shooter has pocketed all of his other balls or misses. Balls must remain in a pocket to be legal. If a ball goes in a pocket, but bounces back onto the playing surface, it is not considered pocketed. If it is the 8 ball, it is not to be considered as either a win or a loss. If it is the cue ball, it is not to be considered a scratch. At least one foot must be on the floor at all times while shooting if a bridge stick is present. There is no foul, simply stop the shooter and hand him the bridge. If any of the following fouls are committed, the penalty is ball-in-hand for the incoming player. Make certain you have ball-in-hand before you touch the cue ball. Confirm it with your opponent before touching the cue ball. Ball-in-hand means you get to put the cue ball anywhere on the table (with the exception of a scratch on the break which result in ball-in-hand behind the head string), and shoot any of your balls (or the 8-ball, if all of your balls have been pocketed) regardless of where that ball is. A player exercising his rights under the ball-in-hand rule may place the cue ball on the table anywhere he desires. Even after having addressed the cue ball a player may, if not satisfied with the placement, make further adjustments with the hand, cue stick or any other reasonable piece of equipment. A foul may be called only if the player fouls the cue ball while actually stroking the cue ball, meaning a double hit of the cue ball (sometimes called double clutching). The ball-in-hand rule penalizes a player for an error. Without this rule, a person can actually benefit by accidentally or purposely scratching or otherwise fouling. In the unlikely event that a game should ever become stalemated, meaning that neither player wants or can make use of ball-in-hand, then the balls would be re-racked and the same player breaks. 1. Anytime the cue ball goes in a pocket, on the floor, or otherwise ends up off the playing surface. 2. Failure to hit a correct ball first: (A player who is shooting stripes must hit a striped ball first.) The 8-ball is not neutral. In general, the shooter has the advantage in close hit situations unless his opponent has asked an outside party to watch the hit. Protect yourself. If you think your opponent is getting ready to shoot a shot that could possibly be a bad hit, stop him from shooting and get someone to watch the shot. Potential bad hit situations are usually fairly obvious and protests and disputes over these close situations can almost always be avoided if someone is asked to watch the shot. If the outside party cannot determine which ball was struck first, the call goes to the shooter. 3. Failure to hit a rail after contact: A rail must be hit by either the cue ball or any other ball after the cue ball and the object ball contact. A pocketed ball counts as a rail. Even if the ball bounces back onto the playing surface, it is considered to have hit a rail, as the pocket liner if part of the rail. A sentence that should answer many questions is: ANY ball must go to a rail AFTER LEGAL contact. 4. The object ball is frozen to a rail and the player is contemplating playing a safety. In order for the following frozen ball rule to be in effect, the opponent must declare that the ball is frozen and the player should verify. Once it is agreed that the ball is frozen, then the player must either drive the object ball to another rail (of course, it could hit another ball, which in turn hits a rail), or drive the cue ball to the rail after it touches the object ball. If the latter method of safety is chosen then the player should take care that he quite obviously strikes the object ball first. If the cue ball strikes the rail first or appears to hit both the rail and ball simultaneously, then it would be a foul unless either the cue ball or object ball went to some other rail. 5. It is illegal and, therefore, a foul to jump a cue ball over another ball by miscuing it up in the air (scooping) on purpose. Accidental miscuing is not a foul unless other rules in this section are violated. 6. Receiving illegal aid (coaching) during your turn at the table: It is not considered illegal aid to remind a player to mark the pocket when shooting the 8-ball, giving advice before the break, or telling a player a foul has occurred. Comments such as “good hit” or “nice shot” or answering a player’s question concerning rules is not considered coaching. Any comments made to a player when it is not his turn at the table are not considered coaching. Anyone may do so. 7. Causing even the slightest movement or altering the course of the cue ball, even accidentally, is a foul. It is not a foul, however, to accidentally move any other balls (including the 8-ball) unless, during his turn at the table, a player moves a ball and it in turn comes in contact with the cue ball. Any balls moved accidentally during a shot MUST BE REPLACED BY THE OPPONENT after the shot is over and all balls have stopped rolling. If it occurs before the shot, it must be replaced by the opponent before the shot is taken. 8. If during the course of a shot, the cue ball does not touch anything. 9. Exercise caution when placing the cue ball in a ball-in-hand situation. The cue ball is always alive. If the cue ball, or the hand holding and moving it, touches another ball it is a cue ball foul and your opponent has ball-in-hand. Be especially careful when you are placing the cue ball in a tight spot. 1. Your opponent pockets his numerical group and legally pockets the 8-ball. 2. You pocket the 8-ball out-of-turn or knock it on the floor. 3. When playing the 8-ball, you pocket the 8-ball in the wrong pocket or fail to properly mark the pocket where the 8-ball went in. 4. You foul the cue ball and then pocket the 8-ball. 5. When playing the 8-ball, you scratch. You lose whether or not you pocket the 8-ball. Note: If you are shooting at the 8-ball and miss it altogether without scratching, you have fouled and your opponent has ball-in-hand, but you don’t lose because of this foul. 6. A game is forfeited if you alter the course of the 8-ball or the cue ball in a game losing situation. You have won the game when all the balls of your numerical group have been pocketed and you have legally pocketed the 8-ball in a properly marked pocket without scratching. To properly mark the pocket, a coaster or some other reasonable marker (to avoid confusion, although it is permissible, we do not recommend marking the pocket with chalk) must be placed next to the pocket the 8-ball is intended to enter. Both teams may use the same marker. Only one marker should be on the table. However, if more than one marker is on the table, as long as you clearly mark the pocket where you intend to pocket the 8-ball you have properly marked the pocket. If the marker is already at the intended pocket from a previous attempt or game, it is not necessary for you to touch it, pick it up, or reposition it. Many of the rules concerning 9-Ball are similar to those used in 8 Ball. When this is the case, it will be so indicated. The rest of the details concerning 9-Ball follow. 9-Ball is played with a cue ball and nine object balls numbered 1 through 9. 9-Ball is a rotation game, meaning the balls are shot in numerical order. The shooter must strike the lowest numbered ball on the table first. The game is over when the 9-ball is pocketed. A player retains his turn at the table as long as he strikes the lowest numbered ball first and legally pockets a ball. He need not pocket the lowest numbered ball to continue shooting. He may, for example, shoot the 1-ball into the 4-ball thus pocketing the 4. He would continue shooting and must, once again, strike the 1 ball first. If the shooter shoots the 1-ball into the 9-ball and the 9-ball is pocketed, the game is over. Nine balls are used and are racked in a diamond shape. The 1-ball is at the front of the rack and on the foot spot. The 9-ball is in the center and the rest of the object balls can be placed in any numerical order. To be a legal break, players must break from behind the head string. The head ball must be struck first and at least four object balls must be driven to the rails or a ball must be pocketed. The cue ball may not be shot into a rail before the rack. Failure to strike the 1-ball first does not result in a foul. If the rack is struck, but the break does not qualify as legal, the balls are re-racked and re-broken by the same player. If the rack is struck, but the break does not qualify as legal and results in a scratch, the balls are re-racked and broken by the opposite player. THE RACK MUST BE STRUCK BEFORE A FOUL CAN OCCUR. Breaking safe or soft is not allowed. The League Operator may make judgments and issue penalties to teams and players who are not breaking hard. Breaking just hard enough to comply with this rule is not a guarantee against penalties. Remember; break as hard as you can with control. 1. A foul on a legal break will result in ball-in-hand anywhere on the table for the breaker’s opponent. Pocketed balls, if any, stay down (are not spotted), except the 9-ball. 2. No balls are pocketed and it is the other player’s turn. 3. The 9-ball is pocketed. This is a win unless the player scratches, in which case the 9-ball is spotted and the turn passes to his opponent. 4. A ball or a number of balls are pocketed. It is still the breaker’s turn and he shoots at the lowest numbered ball on the table. 5. Occasionally it occurs that a player mistakenly shoots the wrong ball. Although it is sportsmanlike for the sitting player to remind the shooting player he is about to foul by shooting the wrong ball, he is not required to do so. Once the shooter has hit the wrong ball, the foul has occurred whether the ball is pocketed or not. If the ball is pocketed, it is permissible, though not recommended, that the sitting player allow the shooting player to continue shooting until he feels inclined to call the foul. The shooting player can escape penalty by quietly realizing his error and returning to shoot the correct ball and striking it first on a shot prior to his opponent calling the foul. In other words, the sitting player must call the foul before the shooter has shot the correct ball. 6. On the shot immediately following a legal break, the shooter may play a PUSH-OUT shot. PUSH-OUT: The push-out was developed to take some of the luck out of pool. A player could protect his turn with a push-out. Push-outs can only be used immediately after the break by the breaker if he pocketed a ball on the break or by the incoming player if no balls were pocketed on the break. A player can elect to push-out if he doesn’t like the shot he is faced with. The Push-out involves announcing the intent to push-out before the shot, or the shot is considered to be a normal shot, and then shooting the cue ball to a new position. The shooter doesn’t need to satisfy the legal shot rule (driving a ball to a rail after a legal hit). Any ball(s) pocketed on a push-out does not count and are spotted. The shooter’s opponent then has the option to shoot from the new position or tell the shooter to take the shot. Normal game rules apply from that point on. Combination shots are legal and extremely common in 9-Ball. Just make sure to hit the lowest numbered ball on the table first. Knocking the cue ball off the playing surface is a foul. Knocking an object ball on the floor is not a foul. Object balls that get knocked off the playing surface will be immediately spotted on the foot spot. If the foot spot is taken, the ball will be placed on a line directly behind the foot spot as close to the foot spot as possible. If two or more balls are knocked on the floor, they are placed in numerical order with the lowest numbered ball closest to the foot spot. Spotted balls are frozen to one another. It might occur that a player legally pockets a ball while simultaneously knocking some other ball(s) on the floor. In this situation, the ball(s) is spotted and the player continues shooting until he misses. Balls must remain in a pocket to be legal. If a ball goes in a pocket but bounces back onto the playing surface, it is not considered pocketed. Other than the circumstances described in BALLS ON THE FLOOR and the Push-Out rule, the only ball that would ever be spotted would be the 9-ball when the shooter has pocketed the 9 ball and scratched or otherwise fouled. If the shooter makes the 9 ball on the break and fouls or scratches, the 9-ball (and only the 9-ball) is spotted. If the shooter is shooting at the object ball and plays it into the 9-ball and pockets the 9-ball, but scratches or otherwise fouls in the process, the 9 ball is spotted. The incoming player has ball-in-hand and will be shooting at the lowest numbered ball on the table. Note: If a ball which has been hanging in a pocket for more than a few seconds suddenly falls in, it is to be placed back on the table where it was originally sitting. 1. The exception concerning scratching on the break does not apply to 9-Ball. Scratching on the break is ball-in-hand anywhere just as other fouls. 2. The foul concerning striking the correct ball first applies, but ignore the reference to stripes or solids. 3. The foul concerning illegal aid still applies, but ignore the reference to reminding a player to call the 8-ball. The 9-ball does not have to be called; therefore, the pocket the 9-ball is going to be pocketed in does not have to be called. In the unlikely event that a game should ever become stalemated, meaning that neither player wants or can make use of ball-in-hand, the game shall end, and the player who broke in the stalemated game will break in the new game. 1. Coaching and timeouts are not permitted in this league. 2. The “three consecutive foul” rule will not be used in this league. 3. Jump cues will be allowed in this league. It is also permissible to break down a cue or switch cues to make a jump shot.